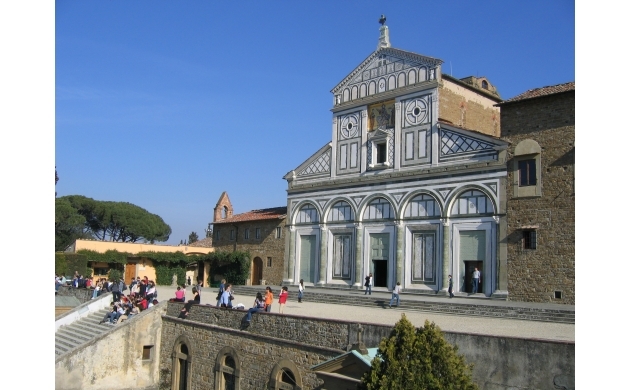 This is the second part of a small study we've dedicated to San Miniato. You can find the first part at this address. The walls of San Miniato are filled with frescoes dating from the 13 to the 15th centuries. Among these frescoes, the depictions of the life of Saint Benedict by Spinello Aretino truly stand out. 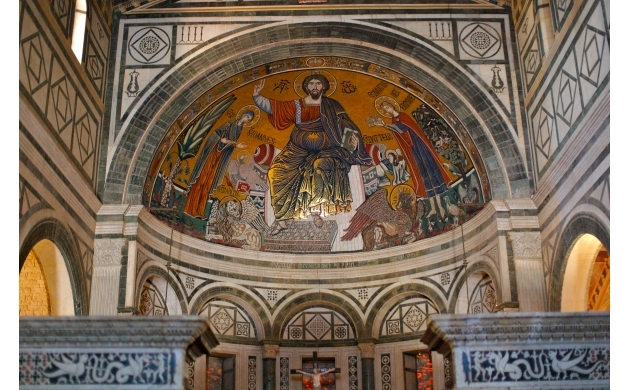 The unique chapel of the Crucifix, situated in the center of the nave, was conceived by Michelozzo in 1448 at the request of Piero dei Medici, and was completed by Agnolo Gaddi and Luca della Robbia. But among the paintings and the sculptures, one feature truly stands out and deserves maximum attention. 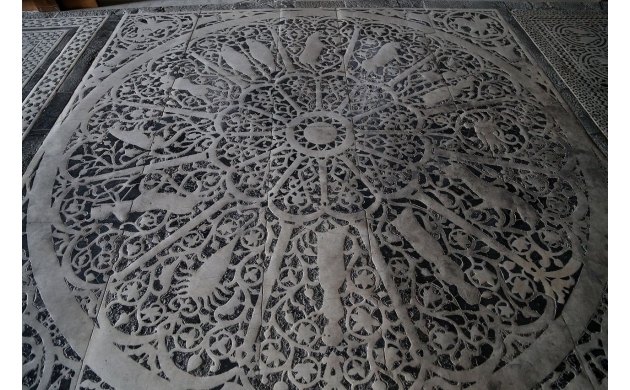 Inlaid on the marble floor of the church one finds the figures of the zodiac arranged in a circle. These symbols hide a secret that was discovered only a few years ago. The zodiac, which dates to 1207, has in fact been revealed to be one of the oldest functioning solstice meridians in all of Europe. In 2011, 800 years after its construction, the astronomic function of the marble construction was rediscovered. On the day of the summer solstice, for a few minutes around midday, the zodiacal sign of cancer is illuminated. This astronomic event at one time coincided with the feast day of the patron saint of Florence: John the Baptist. The monumental cemetery (known also as the "Porte Sante") was built in 1870 right near the church and within the fortified enclosure built by Michelangelo. The cemetery hosts some of the most respected names in Florentine history such as: Montale, Papini, Villari, Stibbert, and Lorenzini (also known as "Collodi" - the creator of Pinocchio). 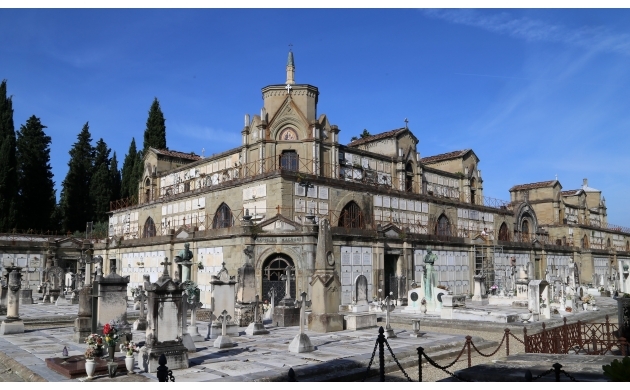 Among the tombs are also found numerous chapels of the wealthy families of Florence, which represent a real repertory of city architecture in the styles of Liberty, Art Deco, Rationalism, and Organic Architecture. Next to the Basilica of San Miniato is located a monastery that is truly worth visiting, both for its beauty as well as for its interesting products. We are talking about the monastery of the Olivetani monks. Since 1373, this monastery has hosted the monks who dedicate their days to prayer and to work in the monastic pharmacy and herbalist shop. Inside this structure it is possible to buy liquors, as well as honey and teas made by the monks themselves. There are also sweets available, such as jam tarts, chocolate and lemon cakes, strudel, and various types of biscuits. As if that weren't enough, during the afternoon at 5:30, it is possible to see and hear the monks as they intone the Gregorian Chants.